The Empire State Building, New York's towering landmark, was once detached from the architectural tradition that gave the building its unique flair. 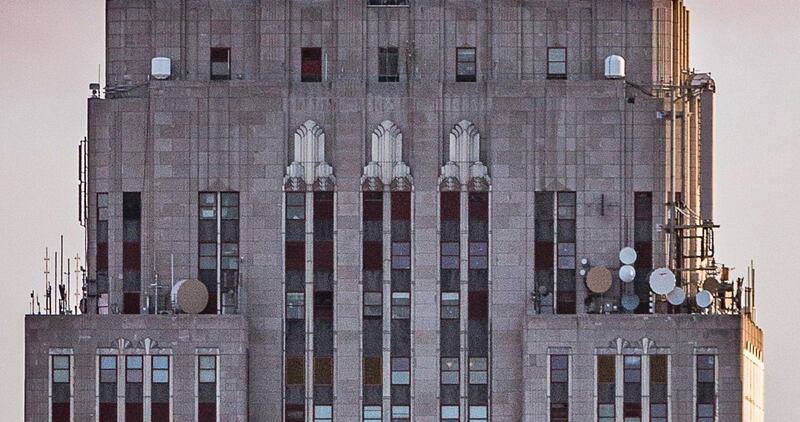 We attempt to rediscover the landmark's stunning Art Deco heritage, and detail the influence of this style on some of the building's definitive features. The article draws interesting parallels between Art Deco movements in New York and Mumbai, highlighting the mobility of this truly global style. Some buildings transcend their physical dimensions to get permanently linked to path-breaking ideas and memories. In addition to being utilitarian skeletons that provide habitable space, these structures emerge as powerful symbols of an era, place, and spirit. Their mere reference conjures vivid images and stories in almost all minds. Empire State Building. For over eight decades, these three words have served as a magic portal to New York City and the United States. Empire State Building, this is sufficient to immediately transport anyone to the bustling and energetic avenues of New York where one finds oneself sunbathing in bright neon lights. and is a timeless romantic allusion to America." For reasons only know to them, Indians have an unrivalled reverence for this monument to the American Dream. Each year on Republic and Independence Day, national newspapers are flooded with images of the Empire State draped in saffron, white, and green lights. The yearly circulation of these images on WhatsApp or Facebook happens with almost celestial precision. A family or business trip to North America is simply incomplete without a photo with the building in the background. Most importantly, you risk offending almost all your acquaintances if you forget to bring along a fridge magnet or key-chain replica of this tower. Such is the power of the Empire State that a nation on the other side of the globe can comfortably project its patriotism and pride on it. Amidst the chaos of these diverse images, Empire State was once detached from the architectural tradition that gave the building some of its most definitive features. Despite an overtly streamlined profile, flamboyant interiors, conscious symbolism and revolutionary steel skeleton, the skyscraper did not explicitly evoke an appreciation for Art Deco in its early admirers. its position as the flagship of this architectural movement." Even the Art Deco Society of New York has the Chrysler and the Rockefeller on its logo but not the Empire State building. The initial confusion surrounding the Empire State is crystallised in an interview between a member of the New York City Landmarks Preservation Commission and Mrs. Lamb, the chief architect’s wife. Mrs. Lamb recalled that William Lamb, Empire State’s chief architect, referred to Art Deco as ‘Little Nemo’ style of architecture. Little Nemo was an elaborately ornamental comic strip famous in the first half of the 20th century for its detailed depictions of landscapes and skylines. According to her, the Chrysler Building’s ornate façade made it the poster-child for Little Nemo Architecture. While, the Empire State’s elegant and clean edifice was defiantly classical. This discomfort surrounding Empire State’s initial classification is understandable. Humans tend to feel comfortable with concepts and ideas that are defined using rigid dichotomies. However, as a transitory style that bridged the gap between the traditional and the modern, Art Deco has embedded paradoxes which make it a challenging tradition to explain parsimoniously. Gold-leaf ceilings, chrome, and marble make Deco ornate, while streamlining makes it elegant. It is modern in the use of materials, while classical in its attempt to be symbolic through murals and motifs. It is rebellious in its attempt to showcase the wealth of a new commercial class, yet aristocratic as it was sustained by networks of patronage. These subtle paradoxes give Art Deco its distinctive flair, and are evident in each of its products. 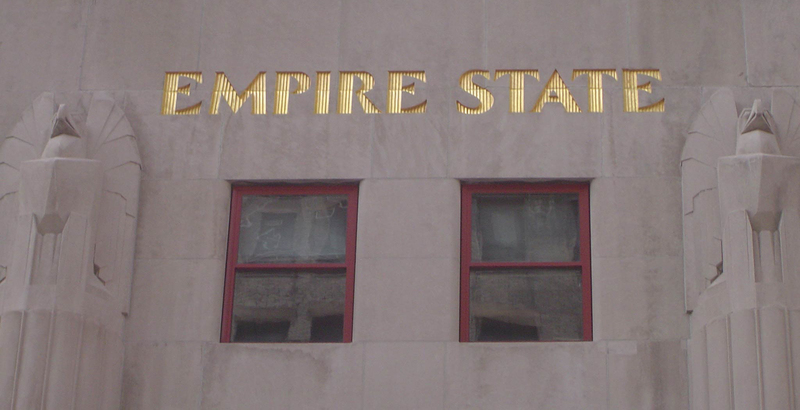 "To effectively appreciate Empire State’s Deco heritage, we have to pay special homage to the conscious contradictions in some of its most distinctive features." The first thing an onlooker notices about this magnificent building is its sky-aspirant height of 1,250 feet. 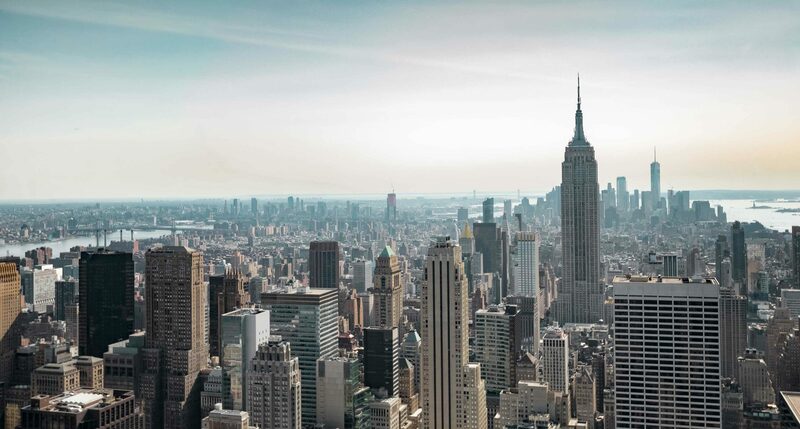 Built in a staggering 13 months and completed in 1931, the Empire State still dominates a dense cluster of skyscrapers in Midtown Manhattan, and confidently rivals newer skyscrapers in New York like the One World Trade Center and One Bryant Park. Its streamlined and elegantly tapering profile pays adherence to Art Deco’s obsession with motion, speed, and aerodynamics. Architect William Lamb refused to adorn the facade with cornices and other classical architectural features to ensure that there was an uninterrupted flow to the building. The skyscraper’s streamlined profile and dizzying height was possible because of the advent of new technologies like steel frame construction. Art Deco buildings aspired to make a bold statement about modernity, and were quick to adopt new materials like steel and reinforced cement concrete. Empire State’s streamlined profile could hence also be understood as a response to zoning laws that prevented vertical construction on the entire plot, allowing scarce sunlight to reach the dense streets of Manhattan. On the other side of the globe, the shorter and cohesive block of Deco buildings in Mumbai were similarly responding to restrictions instituted by the Bombay Improvement Trust. In both New York and Mumbai, parallel modern philosophies found expression in Art Deco. Simultaneously, ‘modern’ materials emerged as an important point of competition in Art Deco buildings in both New York and Mumbai. The 1920s and the 1930s witnessed an unprecedented rise of steel and concrete companies that were consistently trying to make their magic material the staple for modern construction. These profit making corporations were keen on capitalising on the aesthetic and commercial popularity of Art Deco to push their respective materials in the market. The political and economic might of steel firms in the U.S gave the Empire State and its successors their unique lattice frame, while cement companies with dedicated marketing campaigns forced reinforced concrete into Mumbai’s Marine Drive. However, Empire State’s relatively bold expressions of modernity are quickly sobered up by its rather traditional cladding. Architects chose time-tested limestone for its façade which gives the Empire State its renowned classical appeal. In typical Art Deco allure, two eagles in Egyptian style can be found at the top of the entrance. Ornaments like these play an important role in Art Deco buildings as they connect the building’s present with an idealised mythical past. As Eagles were and still are a symbol of America’s political might, their stylised representation in Egyptian form gives Empire State the status of a revered monument built to commemorate America’s newly acquired industrial prowess. However, limestone is not the only material that adorns the façade of this stunning skyscraper. In classic Art Deco style, limestone walls are contrasted with rather modern materials like chrome-nickel steel and aluminium. Vertical bands of chrome-nickel steel encase the windows from the sixth to the eighty-fifth stories, and are capped by fan like motifs that are often interpreted as sunbursts. "This juxtaposition of steel, limestone, and chrome is a beautiful embodiment of Art Deco’s attempt at striking a balance between ornamentation and elegance, tradition and modernity." If Art Deco could be ascribed a cliché, it would undoubtedly be ‘don’t judge a book by its cover.’ Art Deco buildings have historically been defined by their bold and flamboyant interiors, and the Empire State solemnly adheres to this tradition. Marble tiling with rectilinear geometric patterns, gold leaf and aluminium ceiling, and acrylic lighting give the lobby its grand deco charm. Interestingly, these three features are also extensively employed in Mumbai’s stunning Deco cinemas like Eros which highlights the tradition’s mobility and transnational appeal. Additionally, Art Deco’s intense reverence for machines is visible in two grand murals. On the ceiling, planets and stars are rendered as an assembly line of gears in a machine. 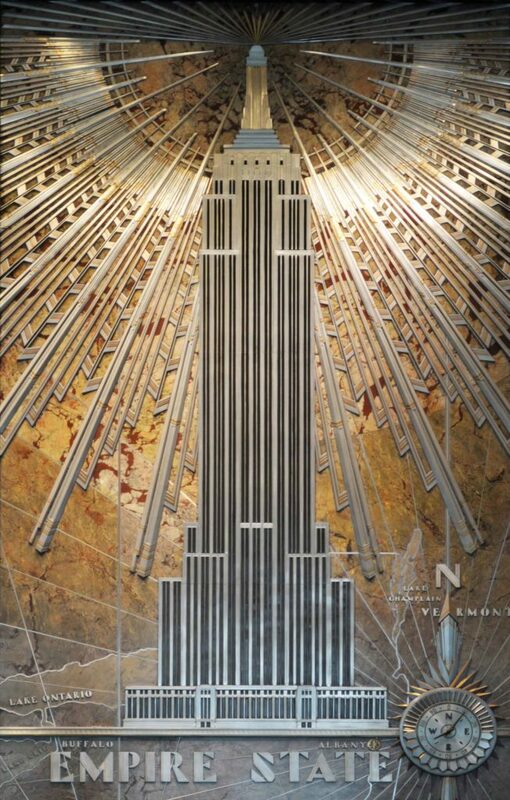 On the wall above the front desk, there is a metal depiction of the building itself with beams of light radiating from its mast which enshrines the Empire State as a beacon of optimism and progress. The extensive use of murals in Art Deco buildings sheds light on another interesting paradox within this tradition. Murals were initially used in churches or state buildings to depict biblical scenes and heroic battles. In addition to being aesthetically pleasing, murals represented authority in pre-industrial societies as they were almost always commissioned by people in power to instil a narrative on the masses. Art Deco appears to have ingeniously adopted this seemingly old tradition to celebrate traits of a modern society like industrialisation, technological progress, and consumerism. Architecture styles are deeply entrenched in the political, economic, and social conditions of their time and place. Across the world, Art Deco was championed and propagated by a new commercial elite that relied on the ‘modern economy’ to make its fortune. Industrialists who produced icons of modern consumerism, bankers, and professionals needed a new style that could flamboyantly celebrate not only their newfound wealth, but also the dynamic society that made this possible. Empire State’s famous rival, the Chrysler Building was conceived by Walther Chrysler, the head of the namesake car company, at the zenith of America’s automobile revolution. In line with her contemporaries, the Empire State was both a product and an icon of this new consumer led society. It was built by John Raskob, Pierre DuPont, Louis G. Kaufman, and other prominent businessmen. Raskob and DuPont were high-ranking executives in General Motors, while Kaufamn was a prominent banker. "The Empire State represented an alliance between cars and credit, two commodities that later became the symbols of American capitalism." Art Deco’s marriage with the elite and capitalist classes is self-evident in New York’s Indian twin. Rulers of Indian princely states, industrial tycoons, and new professionals created dense networks of patronage that allowed Art Deco to flourish in India’s first city. As the ancestor of all modern skyscrapers, the Empire State Building has attained an unprecedented mythical status. So powerful is its allure that newspapers get flooded when it lights up in special colours to commemorate any event. It is memorialised in popular culture through classics like An Affair to Remember and King Kong, and is a symbol of one of the world’s greatest cities. "This awe-inspiring skyscraper beautifully captures some of Art Deco’s defining contradictions, and deserves to be reclaimed as the torchbearer of this dazzling movement. Skyscrapers built almost a century later still find it difficult to mimic its elegance, flamboyance, might, and lustre. 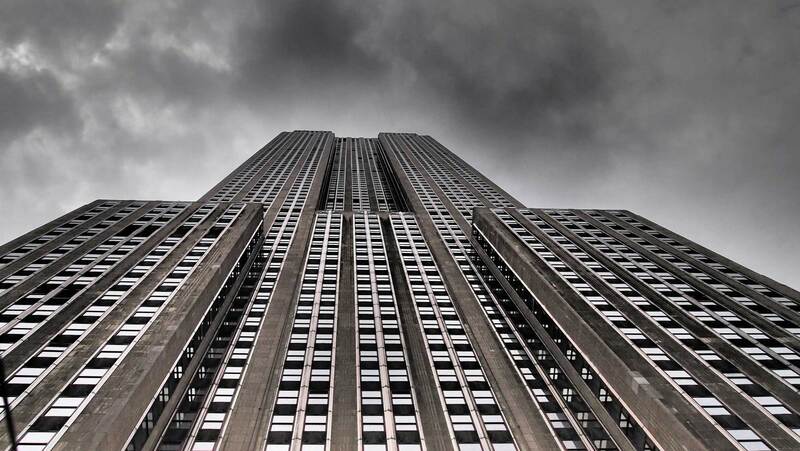 Above all, the Empire State Building is a testimony to Deco’s timeless appeal and grace. It took a while, but the hero has definitely come back home." Chirayu is deeply passionate about Mumbai's overlapping architectural styles. He is a Charles A. Dana Scholar for the Class of 2019, at Bates College, USA where he is a final year student obtaining his Bachelor of Arts Degree with a Double Major in Economics & Politics and a Minor in History. Anthony Robins, “Mrs. Lamb Reminisces,” Journal of the Art Deco Society of New York 1, No. 1 (2016): 9. John Tavranac, “Icon of the City,” Journal of the Art Deco Society of New York 1, No.1 (2016): 4. Margareth, “New York City and the Allure of its Art Deco Buildings,” Bliss from Bygone Days (September 20, 2017): http://www.blissfrombygonedays.com/home/2016/8/25/new-york-city-and-the-allure-of-its-art-deco-buildings. John Tavranac, “Icon of the City,” Journal of the Art Deco Society of New York 1, No.1 (2016): 5. Frank J Prial Jr., “Restoring a Landmark: An Architect’s Perspective.” Journal of the Art Deco Society of New York 1, No. 1 (2016): 6-7. Previous PostPrevious What makes the Victorian Gothic & Art Deco Ensembles a World Heritage Site?